America is at a tipping point! The trumpet is sounding over America. The USA Watch is an invite and call for those who desire to build, connect, and contend for the spiritual awakening, transformation and redemption of America. The walls Nehemiah restored allowed people to walk, communicate and consequently defend Jerusalem. We can no longer face the challenges today without joining ranks. It's time for an "Upper Room Awakening" to join and build the walls of prayer across time zones of America. This is your invite to rise and build! Participation does not interfere or compete with any formed ministry but will strengthen and encourage all involved. Participation will link you to a growing family of watchmen and give you the benefit of insights from others across America. Links you to something bigger than what you can do alone. Collaboration between regions, prayer streams, and ministries as barriers are removed and relationships develop. This is a call and invitation to all who desire and see the need to connect, collaborate and build community to more effectively face the challenges today (Isaiah 62:6; Jeremiah 6:17; Ezekiel 3:17). The USA Watch does not interfere with formed ministries, but rather is a venue for building strength and communication for all involved. Participants keep their identity and call in ministry but affiliate through collaboration and agreement on core values and common vision. No person is too small or ministry too big to participate. Our initial goal is to find 70 watchmen/time zone (10/day) that will contend, build, and connect particularly on the 4th watch for a greater manifestation of the full vision of the watch to emerge (see expected outcomes below). This is a “grassroots” call to build community in prayer/worship through relationships whether it is in your sphere of influence, network, church, region. Simply click the link below and the connection begins. ​For more on the "Who, What, When, Where, Why" of the Watch, click here. Jesus was resurrected from the dead, Mt. 28:1For more information on the 4th watch and its import click here. 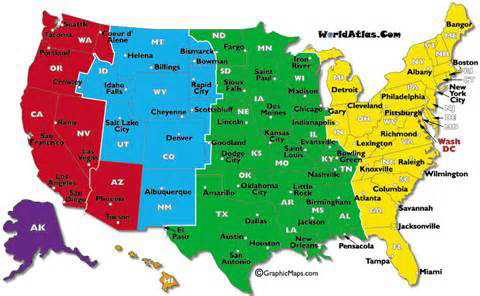 America's time zones represent defined regions in which community and connection in prayer can develop. The 4th watch is a defined time frame in which participants in the time zones can build and connect. As time zones begin to connect, bridging can occur to build the ramparts of prayer across the nation. "Pass the Torch" calls from 5am-6am (the end of the 4th watch) are forming across the nation to intervene and pray for the turning of our nation. To participate in building the "watch" in America for your time zone click here. To facilitate mobilization in your time zone contact us. To read about a model to facilitate development in your region/time zone click here. It releases creative strategy for further prayer/worship advanceFurthermore and more importantly, God is simply doing it. He is waking many people up between 3am-6am. We just have to understand why it is happening and respond. Purposeful ongoing prayer in community is the functional dynamic of a "watch." The impact of "watches" connecting and building will be the igniting power for transformation in cities/nations and re-engage prayer and missions for a vast end-time harvest and the emergence of an alert and ready bride.? These outcomes can be identified as follows:? Culture of prayer and worship to increase in our cities and regions reflected as corporate HOP, communities of prayer arise. Realignment politically, socially with biblical values.